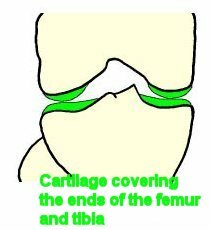 It is the wearing out of the cartilage that lines the ends of the tibia and femur within the knee joint. The ends of the femur and tibia are covered by a smooth, glistening white material called cartilage. The undersurface of the kneecap is also covered with such a cartilage. Thus, the movements of the knee are carried out in a smooth, painless fashion. Wear can be incomplete, in which case the cartilage is still present, but thin and irregular. X-rays demonstrate a narrowing of the space between the bones. The wear can be complete, in which case cartilage has essentially disappeared. We are now dealing with a "bone on bone" situation, i.e. bone rubs against bone whenever the knee moves. This is quite painful. On x-ray, the space has essentially disappeared between the bones, and the bone itself may start to wear down. 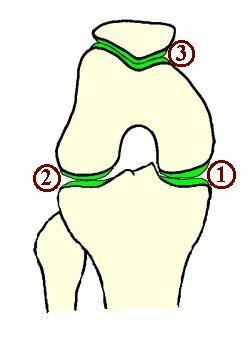 The arthritis can lead to wear and tear of the soft meniscus which is present between the bone. 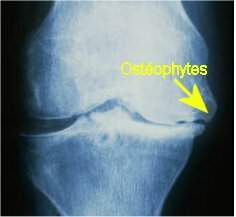 The arthritis is often accompanied by bone spurs (osteophytes), which are quite apparent on x-rays. Where is the arthritis ? - Medial femoral-tibial arthritis (1), which involves the medial (inner) aspect. 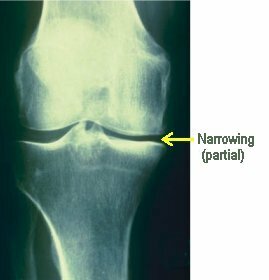 - Lateral femoral-tibial arthritis (2), involving the outer aspect of the knee. 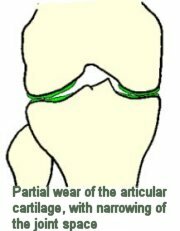 - Patello-femoral arthritis (3), involving the knee cap. - Global arthritis involving every aspect of the knee. - The alignment of the legs can be an important factor. People can be either bow-legged or knock-knee'd. In the case of a bow-legged patient, more pressure is placed on the inner aspect of the knees, while a knock-knee'd person places more weight on the outer aspect of the knees. The bow-legged person is said to have "Genu Varum" while the knock-knee'd person has "Genu Valgum." The abnormal distribution of pressure can lead to wearing of the cartilage. - Being overweight naturally places excess pressure on the cartilage. - On occasion, arthritis occurs for no reason that we can detect, and seems to simply be related to age. - Arthritis can be due to prior trauma : this would include a prior fracture within the knee joint, a prior ligamentous injury (especially the ACL), a prior tear of the meniscus, especially if the entire meniscus has been removed (the meniscus is an important shock absorber). - Certain diseases can lead to arthritis including infections, rheumatological conditions (especially rheumatoid arthritis) and osteonecrosis (a loss of blood supply to the bone), most commonly found at the end of the femur. Pain is the primary symptom. It is pain that the patient notices, pain which brings the patient to the doctor and pain which will dictate the treatment chosen. Stiffness is a later finding, manifested by difficulty in straightening and/or bending the knee. Later yet, deformities of the knee can appear, especially exaggerated genu varus or valgus. All of these findings eventually limit the patient's ability to walk and lead the patient to use canes. Fortunately, thanks to existing treatment options, the patient is not likely to gradually deteriorate to the point that he or she needs a wheel chair as in earlier days. The main focus of treatment is to alleviate pain. There is no recognized treatment which replaces the worn out cartilage. There are no magic pills proven to work, and cartilage transplantation is still experimental. The initial treatment is non-operative. When this fails, one can consider surgery. 1. The osteotomy which straightens the leg and places the knee in proper balance. 2. The prosthesis which replaces the worn out cartilage.